Stars: Taron Egerton, Jamie Foxx, Ben Mendelsohn, Eve Hewson, Jamie Dornan, Paul Anderson, Tim Minchin, F Murray Abraham, Ian Peck, Cornelius Booth. The legend of Robin Hood, the roguish outlaw with a strong sense of justice who robbed from the rich and gave to the poor, takes a bit of a battering in this largely unnecessary and messy cinematic outing. There have been many versions of the colourful, iconic character, with Errol Flynn probably best capturing his swashbuckling nature and heroic swagger. Then there was the British tv series from the 50s featuring a dashing Richard Greene as the eponymous hero, Kevin Costner’s fanciful take in 1991 with Robin Hood: Prince Of Thieves, and Mel Brooks’ 1993 parody Men In Tights. This new take on the story is not as dour as the Russell Crowe treatment in Ridley Scott’s film from 2010, as it delivers plenty of kinetic energy and action. 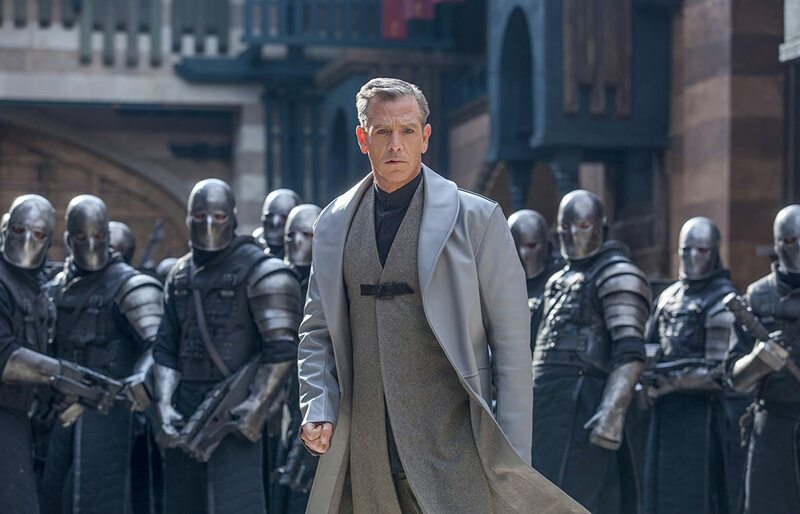 Robin of Loxley (played by Taron Egerton, from Kingsman, etc), a respected nobleman in Nottingham, loses everything when the evil Sheriff of Nottingham (Australian Ben Mendelsohn, from Animal Kingdom, etc) sends him off to the middle east to fight in his crusade against the Moors. During the long and brutal fighting Robin runs afoul of Guy of Gisbourne (Paul Anderson, from tv series Peaky Blinders, etc), a thuggish sort who enjoys inflicting brutal punishment on prisoners of war. When Robin intervenes to save the life of the young son of Moorish commander Yahya (Oscar winner Jamie Foxx, from Baby Driver, etc), he earns Guy’s enmity but the respect and admiration of his enemy. Returning to England after four years, Robin discovers that he has been presumed dead, and that the sheriff has confiscated all of his property to pay back taxes. And his girlfriend Marian (Eve Hewson, the daughter of U2 frontman Bono) has married Will Scarlet (Jamie Dornan, from the Fifty Shades trilogy). Nottingham is under martial law and the fascist sheriff, in league with the Church itself, is ruthlessly collecting taxes to promulgate his ongoing war. Robin begins a campaign of harassment against the sheriff and his army, robbing their sources of income and redistributing the wealth. Yahya trains Robin in the art of archery to make him a more formidable fighter. Robin’s acts of rebellion make him a folk hero and inspire the oppressed people to rise up against the tyranny of the sheriff. Robin Hood marks the feature directorial debut of Otto Bathurst, who hails from a background in television having directed episodes of series like Peaky Blinders and Black Mirror, etc. Bathurst has a bombastic style that is reminiscent of Guy Ritchie’s recent misguided take on the legend of King Arthur, which bombed at the box office. Visually the film seems inspired by Assassin’s Creed and its ilk, and while Bathurst brings a kinetic sense of energy to the action sequences, they have a video game sensibility about them. Bathurst’s approach to the material is robust but the action scenes have been frenetically edited by Chris Barwell and Joe Hutshing in that typical style of modern action films that renders them jumbled and confusing. Some of the early scenes during the Crusades are quite brutal and come across like a medieval version of American Sniper, with arrows wreaking havoc on both bodies and buildings. Visually, Bathurst and his cinematographer George Steel (Peaky Blinders, etc) paint a dystopian view of Nottingham here as a grim and dirty mining town. Visually the film is depressing and bleak with a dark palette. The production design from Jean-Vincent Puzos (The Lost City Of Z, etc) has a steampunk sensibility about it. The film is laden with anachronistic touches, such as the heavy weaponry, the cliched and modern sounding dialogue, and the stylish leather costumes worn by the main characters. And the CGI in some of the action sequences is dubious. The script has been put together by Bathurst and his two collaborators, first time writers Ben Chandler and David James Kelly who give the film a more modern aesthetic, but this is something of lazy, empty and soulless spectacle. They also give the film some contemporary resonances with mentions of the politics of fear and division and the war on terror. They also turn Robin Hood into a superhero-like character. And the love triangle between Robin, Marian and Will is sketchy and lacks any sort of emotional pull. Rising young star Egerton brings the same sort of boyish bravado to his portrayal of Robin Hood as he brought to Eggsy, his naïve trainee spy in the Kingsman movies, but he is pretty much a one-note character. Hewson makes for a feisty and more independent Marian that we are used to seeing on the screen. Foxx has a strong physical presence as Yahya, who follows Robin back to England from the Middle East and later becomes known as by the more Anglo-Saxon name of Little John. Mendelsohn hams it up as the evil sheriff, although I much prefer Alan Rickman’s scene stealing and scenery chewing performance from Costner’s version. Mendelsohn often makes for a delicious villain, but here his character bears numerous similarities to his Star Wars character, which became a little distracting. However, he tries to elicit some sympathy for his character by talking about the childhood abuse he suffered. Australian entertainer Tim Minchin is miscast and uncomfortable as a buffoonish Friar Tuck, although he does bring some humour to the material. And Oscar winner F Murray Abraham (Amadeus, etc) brings an icy menace to his small role as the corrupt Cardinal. A narrator tells us from the outset to forget everything we think we know about the famous outlaw, but instead audiences would do better to forget about this messy film which plays around with the familiar elements of the legend. This new version of the story works best as an origins story which gives us the backstory of how a fourteenth century nobleman and battle-hardened warrior became one of England’s most famous and revered outlaws. But any hopes of this film yielding a new action franchise are hopefully still born after this mess.